VISI PEPS-Wire incorporates the industry leading PEPS Wire EDM CAM system, developed specifically for the precision engineering, tool-making, mould & die, press and extrusion tool industries, within the VISI design environment. Fully feature based, VISI PEPS-Wire provides automatic feature recognition of wire features including tapered, variable taper and 4 axis directly from solid geometry. Features are easily machined creating reliable Wire EDM toolpaths and proven CNC code for all Wire EDM machine tools. VISI can work directly with Parasolid, IGES, CATIA v4 & v5, Pro-E, UG, STEP, Solid Works, Solid Edge, ACIS, DXF, DWG, STL and VDA files. The extensive range of translators ensures that users can work with data from almost any supplier. Companies working with complex designs will benefit from the simplicity with which their customer’s CAD data can be manipulated. 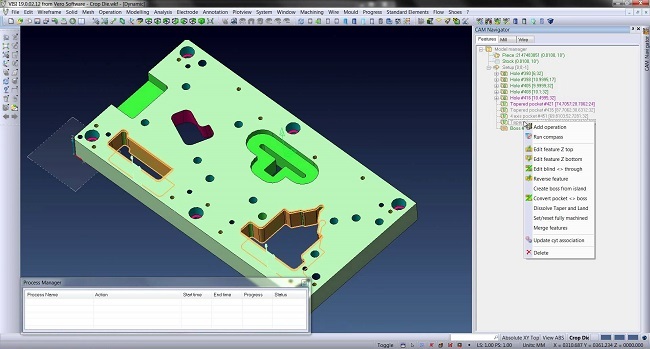 VISI can work directly with wireframe, solid, surface and mesh data or a combination of all four, providing the user with tools to work with any CAD model or to quickly construct the information from paper drawings ready for wire machining. VISI PEPS-Wire offers powerful automatic feature recognition developed specifically for Wire EDM technologies. Detection of ‘through’ features including holes, open and closed pockets, constant taper (including constant radius and conic corner modes), variable taper, taper and land, variable land and 4 axis is effortlessly achieved at the click of a button. The resulting features are grouped appropriately so that they can be machined quickly and reliably using the preferred machining method and technology. Using native VISI graphical tools it is very simple to edit advanced features such as 4 axis or variable tapers. User ‘constraints’ or ‘synchronisation lines’ are easily added to 4 axis features and the results dynamically update; particularly useful when designing extrusion dies. Variable tapered features can be edited graphically by dragging the angle on individual faces of the feature; this is achieved using interactive graphical sliders found extensively throughout the VISI environment. VISI PEPS-Wire allows the user to provide multiple start holes on a part. The system can automatically establish tags near to the start of each new hole location. In VISI PEPS-Wire it is possible to select from several different methods of unattended machining. If your machine is equipped with automatic wire threading, then you will most likely want to run unattended as long and as often as possible. Unattended machining is performed by leaving the slugs attached while all of the preliminary cuts are taken. Numerous strategies are available to cut the part; for instance, taking all of the rough cuts before finishing, in which case all rough cuts are taken while leaving the tags attached, then the tags are removed, and finally the finish cuts are taken. Alternatively, take the rough and finish cuts while leaving the component or waste material in place and then remove the tag and finish this area. The completed wire path can be simulated using rendered solid model graphics, including fixtures and target geometry. Any collisions that are detected are highlighted both on the model and via on-screen messages. As slugs become detached, the simulation advises the operator and graphically removes the part, emulating the cutting process on the machine tool exactly. Toolpath verification also tests whether the completed part is removable from the component. It is also possible to perform a part comparison between target model and cut part, which highlights any rest material or gouges. VISI PEPS-Wire supports a comprehensive range of EDM machines from leading Machine Tool manufacturers including Agie, Charmilles, Brother, Fanuc, Hitachi, Makino, Ona, Sodick, Seibu and Mitsubishi. Machine Tool supplied technology data is also included for supported machine tools together with JOB/Script file output for Agie and CMD file output for Charmilles. The advanced post processors are easily configured to suit different machine models and configurations. Automatic approach and retract technology to allow power to be "ramped" up and down gradually.